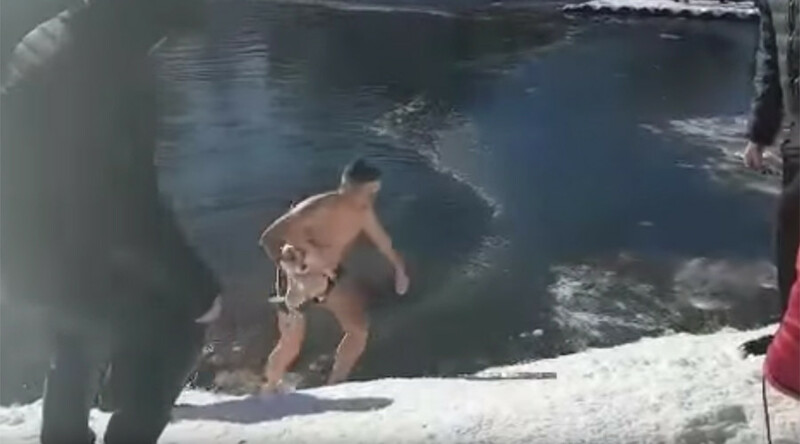 A man in Crimea, Russia, stripped to his underwear and jumped into a freezing pond to save a dog struggling to get out, after the ice cracked and the animal fell through. Both man and dog safely made it out, with the video of the rescue becoming a YouTube hit. The incident was reportedly filmed over the weekend in Gagarin Park in the Crimean city of Simferopol. As the video shows, part of the pond’s surface was covered in ice. Having fallen in, the unfortunate animal was unable to pull itself out, repeatedly sliding back into the freezing water. A man noticed the peril the dog was in, and a few minutes later was at a small pier stripped to his underpants, ready to save the day. He jumped into the frigid water and moments later managed to grab hold of the animal, emerging onto the bank with it in his arms. The video is believed to have been filmed on Saturday, when the temperature in Simferopol was a chilly -5C (23F). With the area also facing cold winds blowing from the sea, it would have felt a lot brisker. The video was posted on YouTube and within hours had reached 100,000 views. Dozens of people commented on the bravery of the rescuer, wishing him good health – after all, not everyone in Russia is used to winter bathing. “Wish him strong health and wellbeing! His heart is obviously a healthy one,” one post read. “Good man. Our planet still revolves thanks to such people!” another person stated.